Many who've followed me for a while on here, or who know me personally know that I've moved all to frequently over the last 10+ yrs......and along the way have struggled at times financially. And while at this point I'm not planning on moving again anytime soon (Lord willing that is! ), the financial issues are still there as I deal with an income that has been anything but regular over the last 18 months or so, and doesn't seem to be getting any more stable at this point. At any rate, my thoughts yesterday were challenged by an email I had received on the topic of contentment (from Rachel Cruze who is Dave Ramsey's daughter). "You might have the head knowledge, the income, and even a monthly budget—but you still feel like a hamster on a wheel, running as hard and fast as you can." "People who practice contentment . . .
don’t spend as much money because they don’t feel the pressure to keep up with a certain standard of lifestyle they can’t afford. can break the cycle of living paycheck to paycheck because they don’t have to spend money just to feel good. But contentment isn’t a place you get to financially when you finally have “enough” money in your bank account or the brand of car you always wanted. It’s deeper than that. Contentment is the inner peace that comes with being happy and fulfilled wherever you are, with whatever you have. The Apostle Paul put it like this: “ . . . I have learned how to be content with whatever I have. I know how to live on almost nothing or with everything.” (Philippians 4:11–12 NLT)." None of these statements mean just accepting things as they are without trying to improve things. But instead for me, it does mean that I need to make even more of an effort to look at what is in my life (people, things and what's happening) with even more gratitude and from the work to be content while working to get out of debt and improve things in my life. So, how are you working towards a life of contentment? 1. For unexpected blessings like the two prizes I've been blessed with this week from two different giveaways on IG and a blog hop. 2. For unexpected early time off of work one day this week. Found myself not able to sleep early Sunday morning so I got up and finished pin basting this little quilt and then quilted it before getting ready for church. Got it bound in the afternoon. 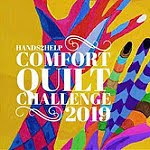 It will be going to Jack's Basket as part of the Hands 2 Help challenge this spring. You can read more about the challenge by clicking here. Backing was the perfect size and color and from my stash. 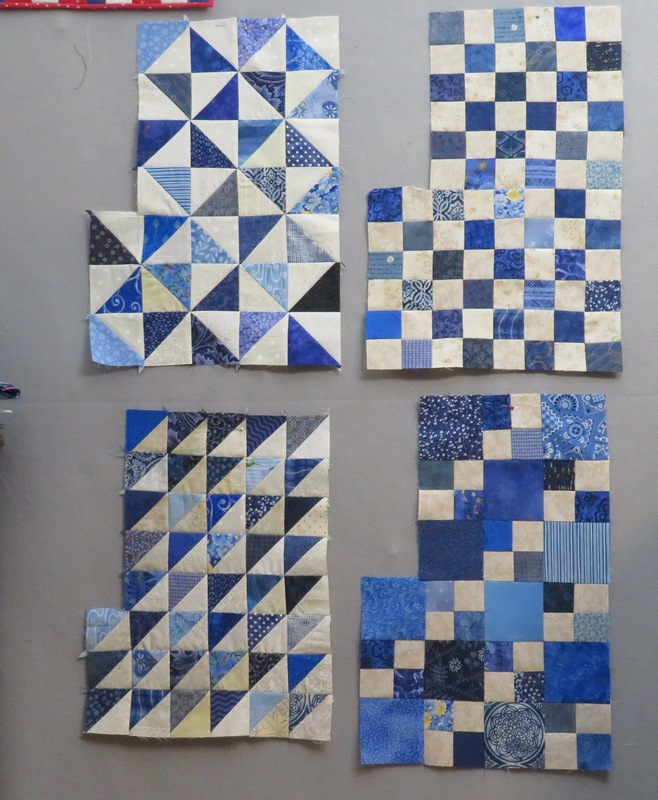 The four blocks in the quilt were all samples that I made as I was testing new block patterns several years ago. 1. Found the beads and other materials I needed to make the bracelet portion of the medic alert bracelet that I really should be wearing but haven't been. 2. For friends who challenge to keep growing in my faith instead of remaining stagnant. 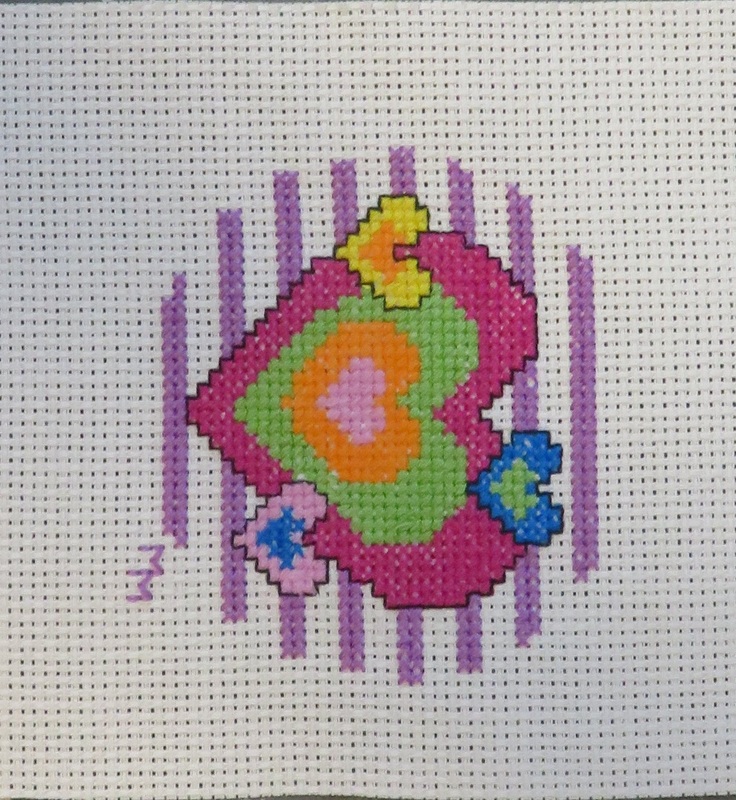 One lesson learned when working on the cross-stitch motifs - my eyes no longer like working on darker colored aida cloth. It was a pain to try and see where the dratted holes were....lol. Now that might have been because I was working on it too late at night and/or because I really, really need new glasses....but whichever, I'm thinking I need to stay with white or cream or even just light colored cloth in the future. And this is the last cross-stitch UFO that I've found in my stuff.........well, at least in the smaller projects. I haven't gone through the tote filled with my large cross-stitch kits to see what I've got in there. 1. One paycheck has been received...only one behind now instead of two. 2. found someone to mow the yard for me since my knee is still not at all cooperative. Lots of fun with scraps this month as I worked with some bonus HST's leftover from a wedding quilt I made last year and scrap strips from the stash. These are "blanks" that will be used to make Christmas stockings from. The three 'blanks' made from squares came about because I ended up with too many strip sets and just couldn't see them going to waste or ending up back in the UFO bin. Two of them will end up going for commissioned order that is due around the end of July. The remaining ones will be finished off and sold. Scraps leftover from cutting the stockings will end up in quilted postcards. 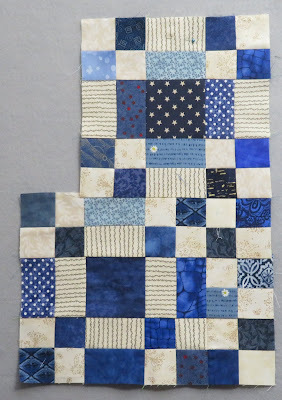 Kate and Gun host a monthly blog hop featuring the use of scraps. 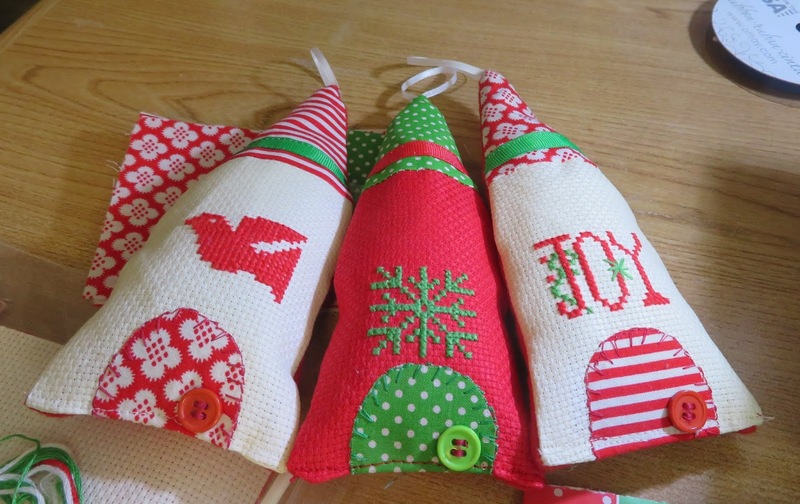 Check out what everyone in the hop has done with their scraps this month. 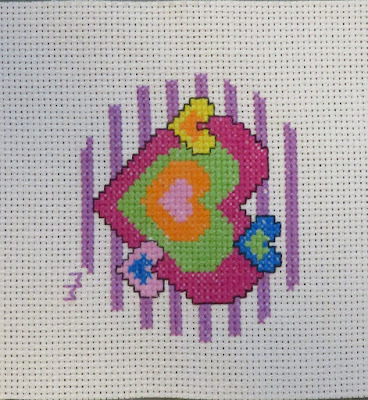 I finished off another cross-stitch UFO this weekend. This little piece is about 5" in diameter and ultimately will end up most likely either in a postcard or mug rug. 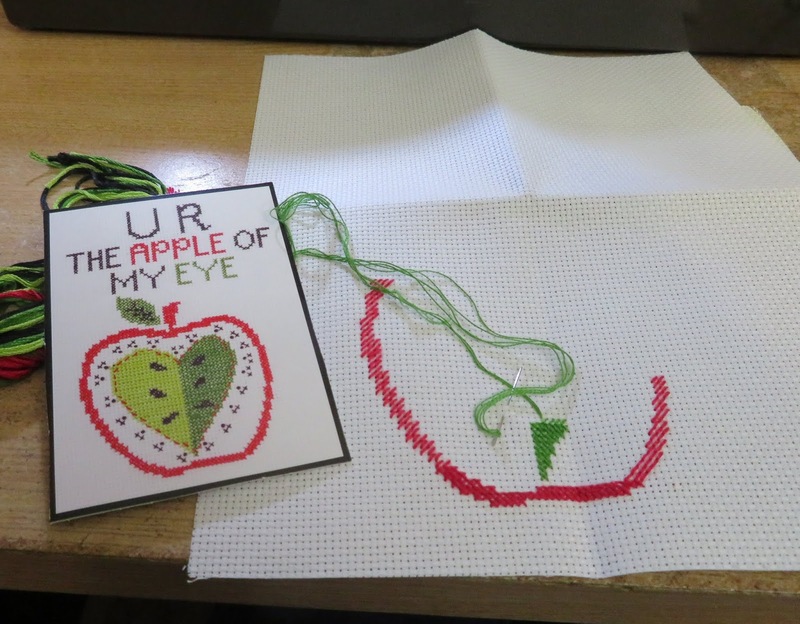 Once the hearts were done, I looked through the tote with the rest of my little cross-stitch kits to see what else might be in progress and found this. 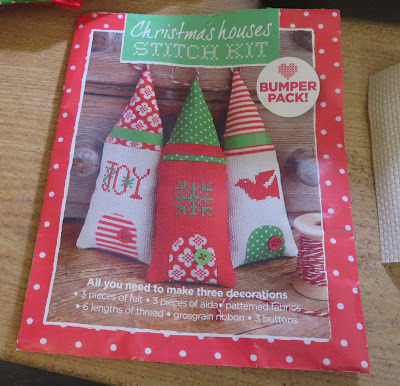 It was a free kit that came with one of my British cross-stitch magazines several years ago. I had foolishly not kept the chart, but the picture is large enough to be able to count the number of stitches needed for the ornaments. I had two kits and had done the stitching on two of them. And even had sewn the first three together, but not stuffed them. First three are now totally finished, and they are being used as the patterns for the remaining three ornaments. I've got the stitching finished for Joy, and am working on the remaining two. 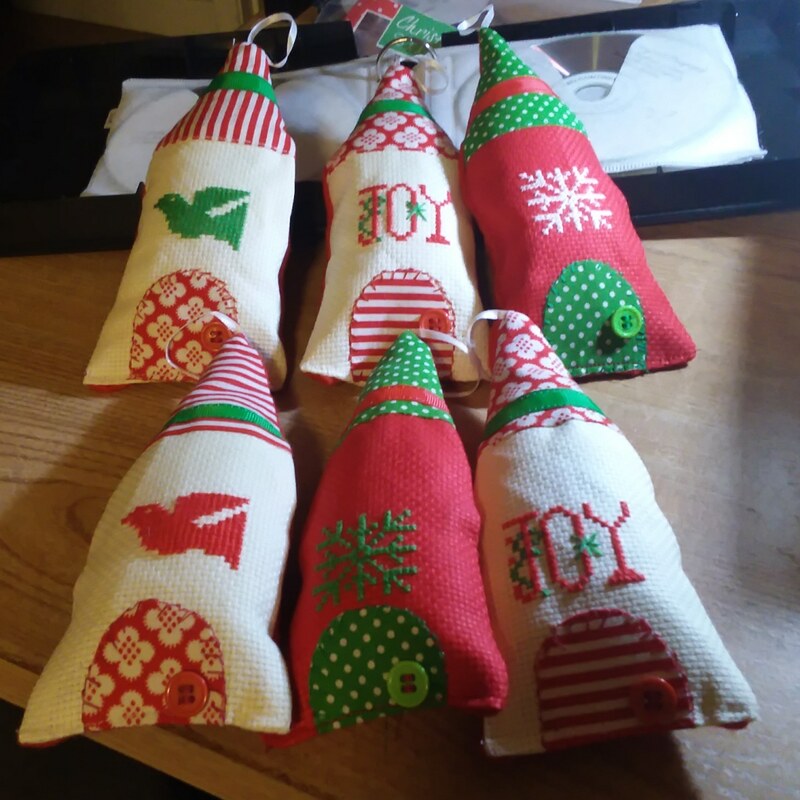 I'm changing up the colors a little so that all 6 ornaments will be different when completed. Three more snails have been completed. The shells started with orphan blocks from many years and several states ago. 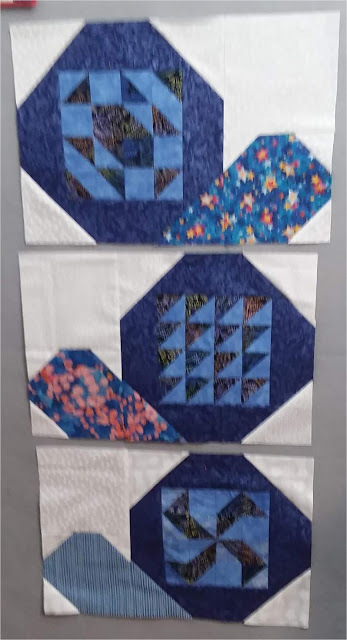 These were 8" blocks that were made for a BOM at a quilt store that were made with Thangles. 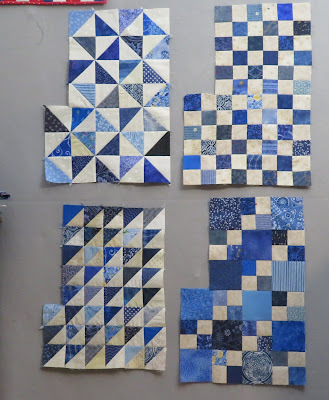 To bring them up to a usable size for the quilt I bordered each of the three blocks with a navy Fairy Frost that was in my stash. All other fabrics are from scraps in my stash. I've been quilting and sewing for more than 45 years. I always have more than one project going at a time and do a lot of donation work for Sunshine quilts and American Heroes. 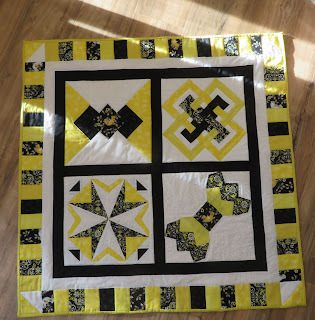 In addition, I do a lot of commissioned quilting and sewing for others. 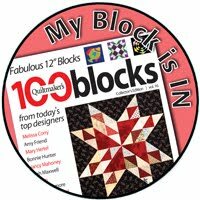 A prolific designer of quilt blocks, quilts, and other quilted items, I specialize in paper-pieced and applique designs. 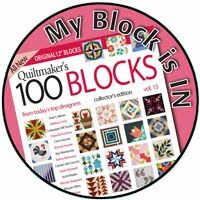 I’ve had multiple blocks and designs published by QuiltMaker magazine in their 100 Blocks magazines. I’m always willing to work up a custom design for clients, but won’t infringe on copyrights of other designers. Copyright 2009-2017. Powered by Blogger. All posts and their content, including pictures, on this blog are the sole property of Moira McSpadden © 2009-2018. You may use my tutorials for personal use, or refer friends to the appropriate blog page so they may use them. You do not have permission to use my words, photos, or partial or complete blog posts, printed or using other technology, either for a class or reposted on a blog or website without asking permission first. For permission, you can email me by clicking in the sidebar on the "This is Me" link to find the page with a link to e-mail me. Thank you.